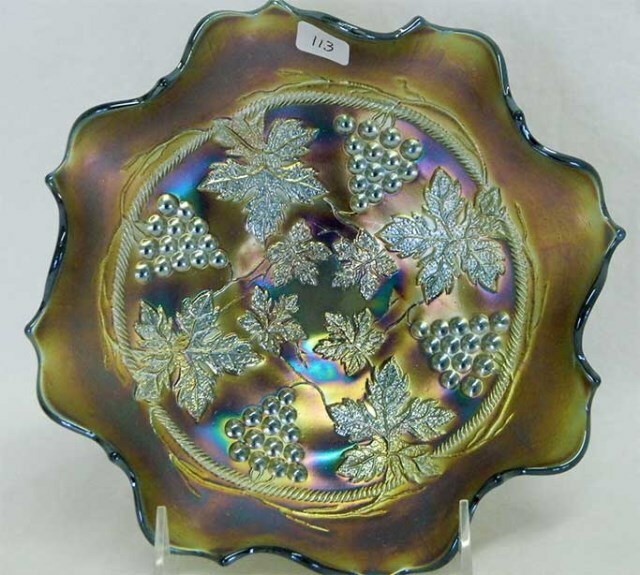 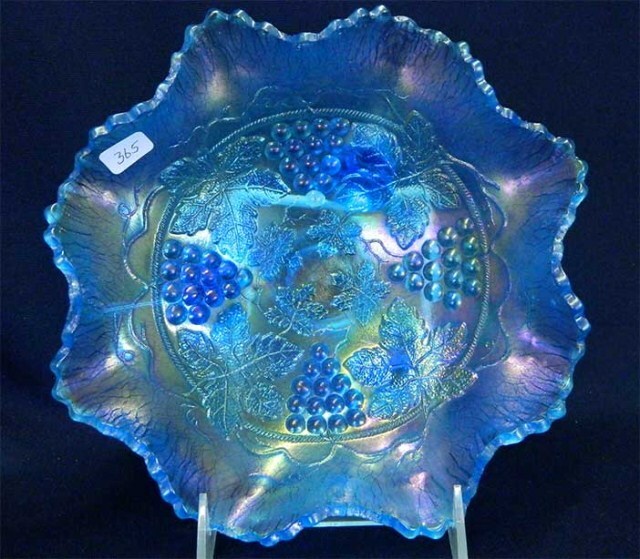 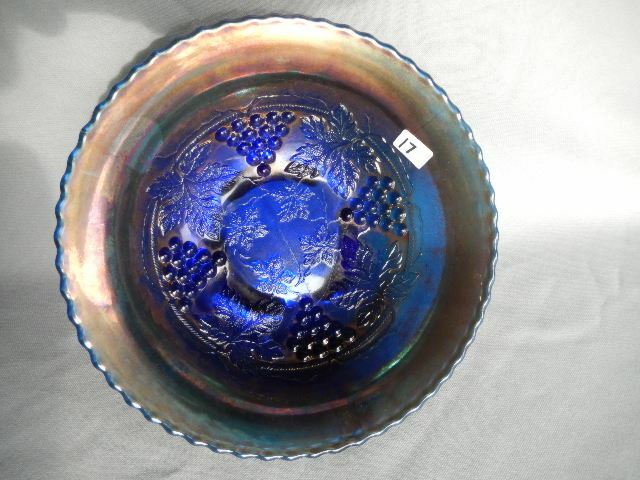 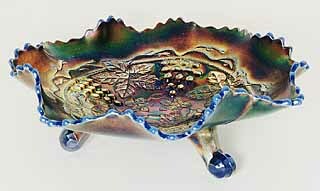 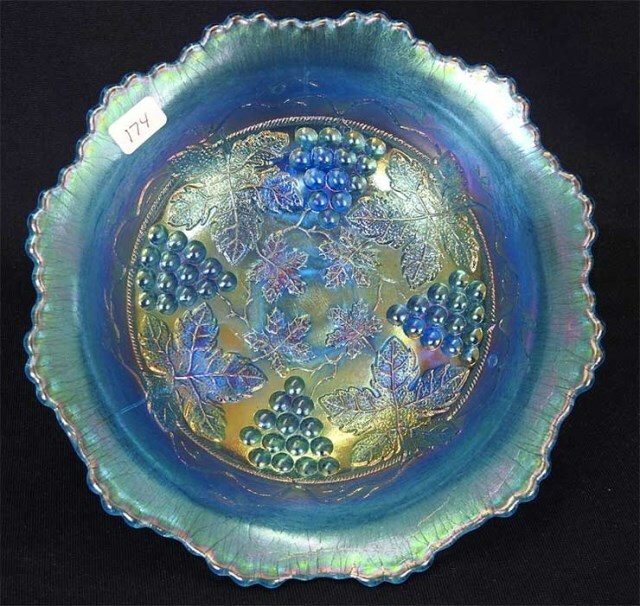 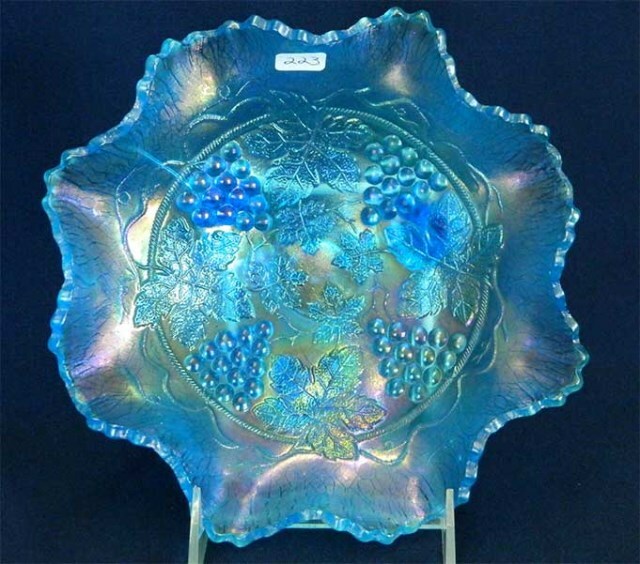 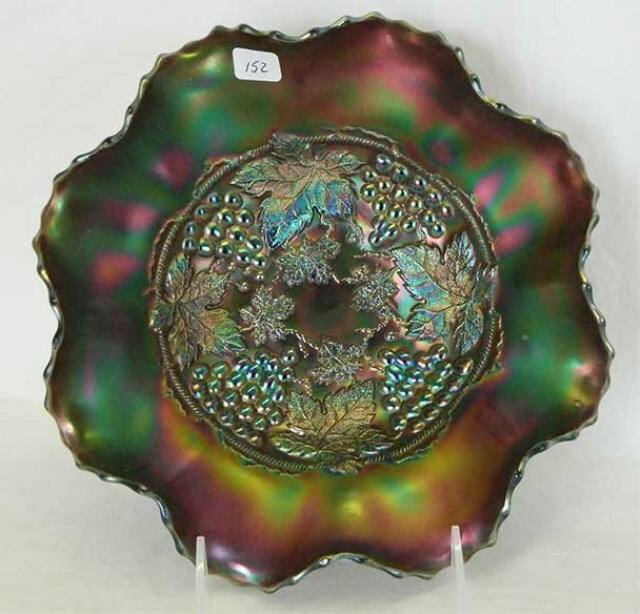 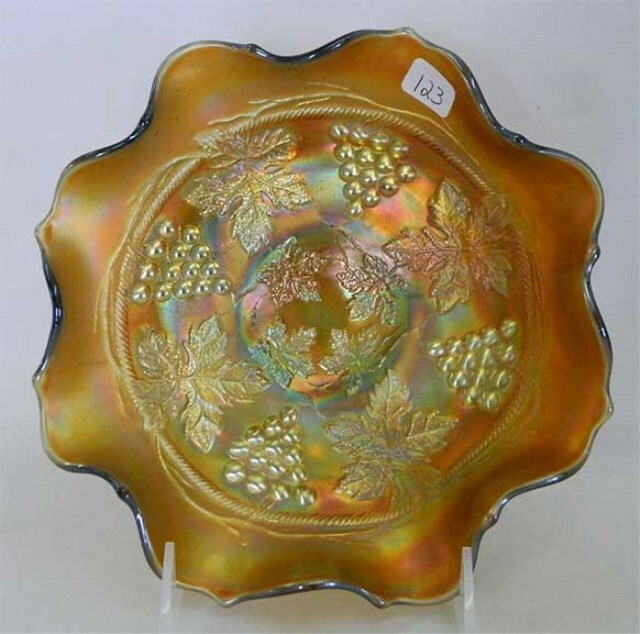 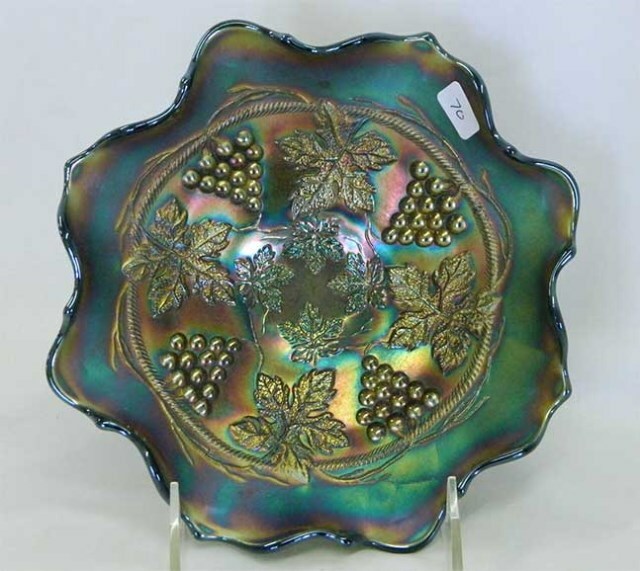 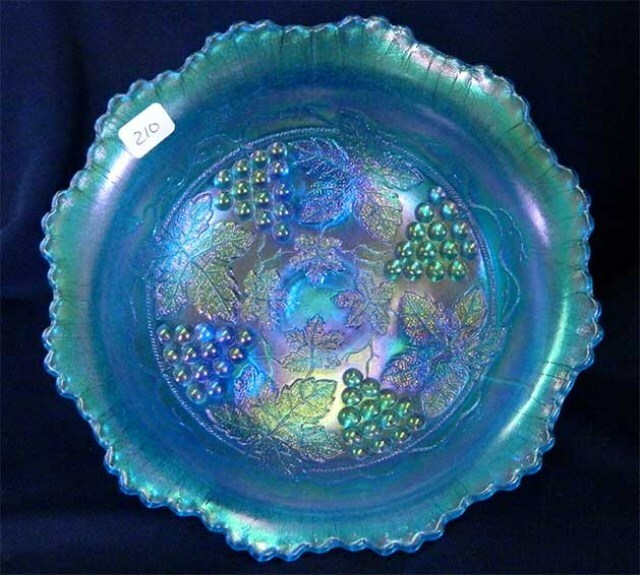 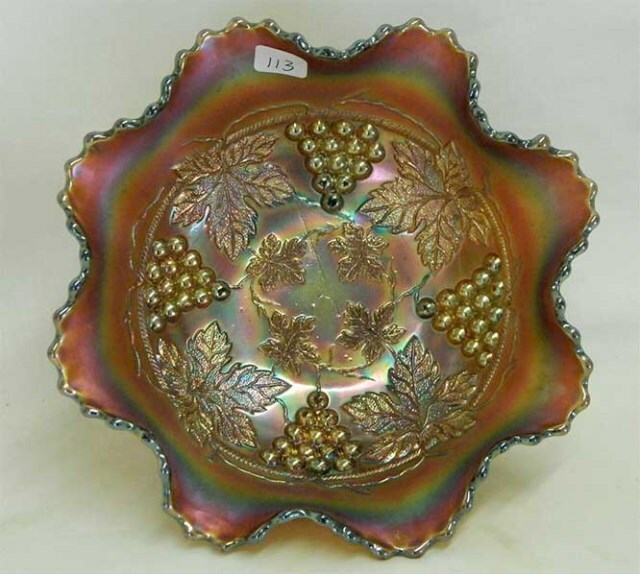 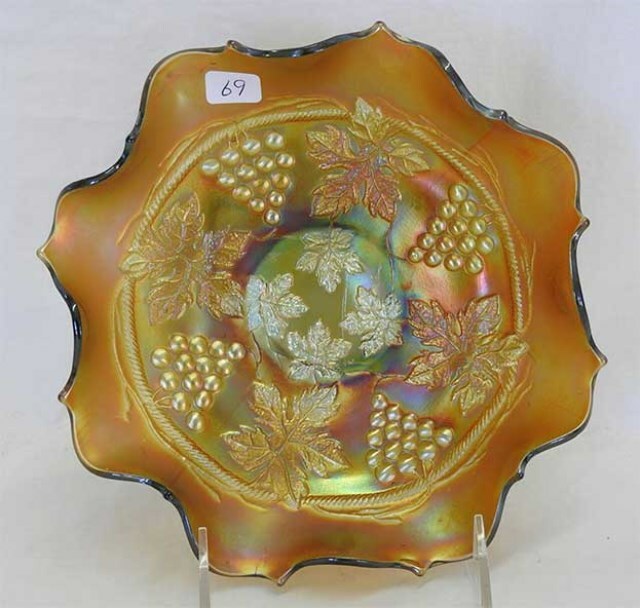 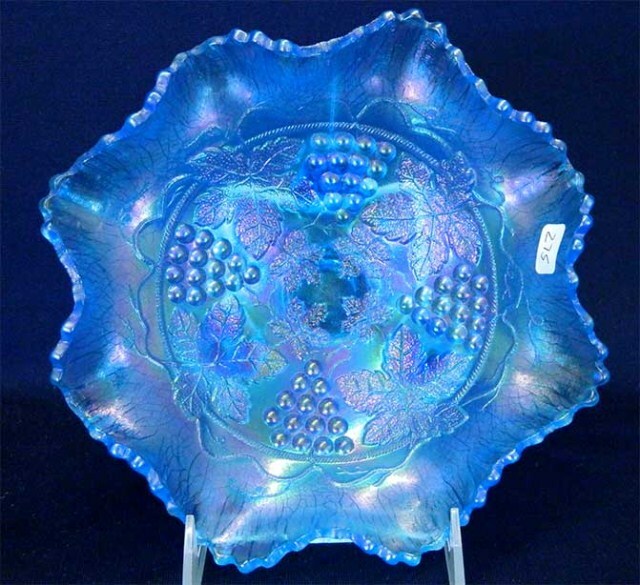 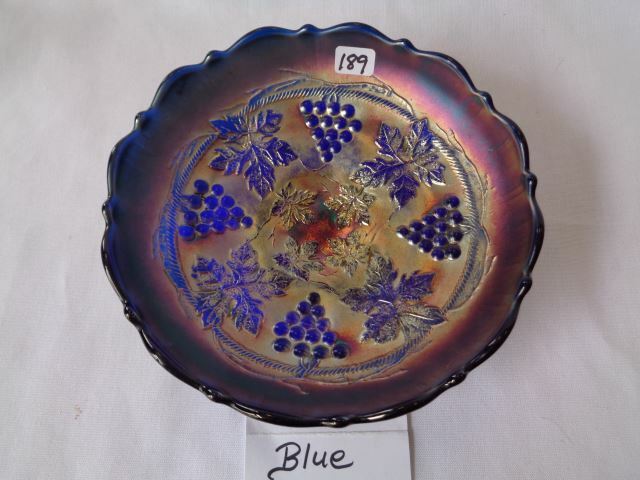 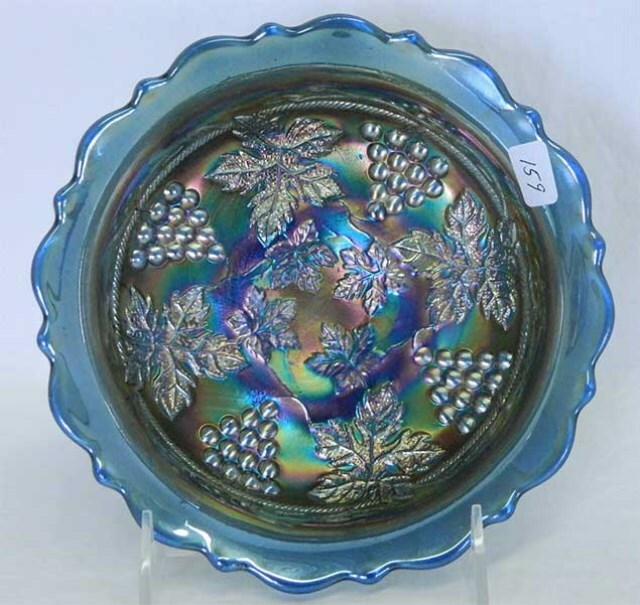 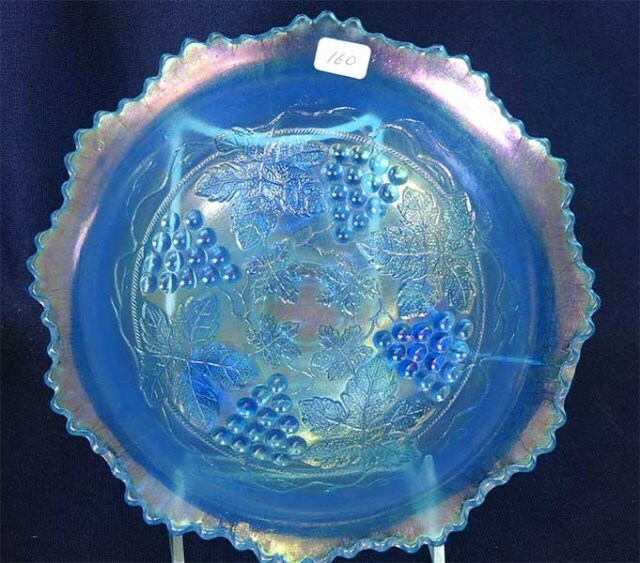 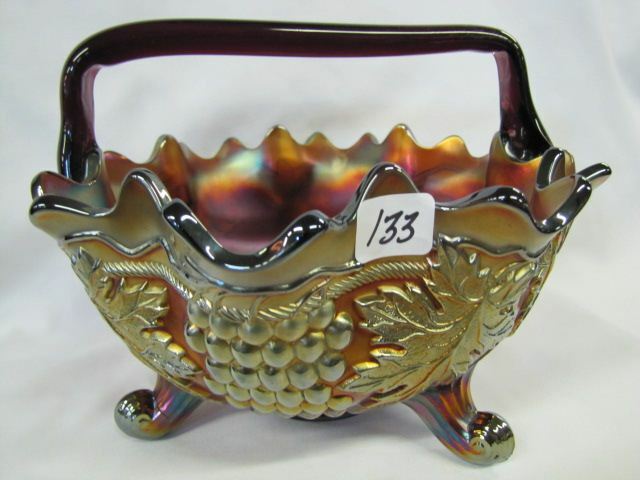 A continuing point of confusion among Carnival Glass collectors is the difference between Fenton's Grape and Cable and that of Northwood. 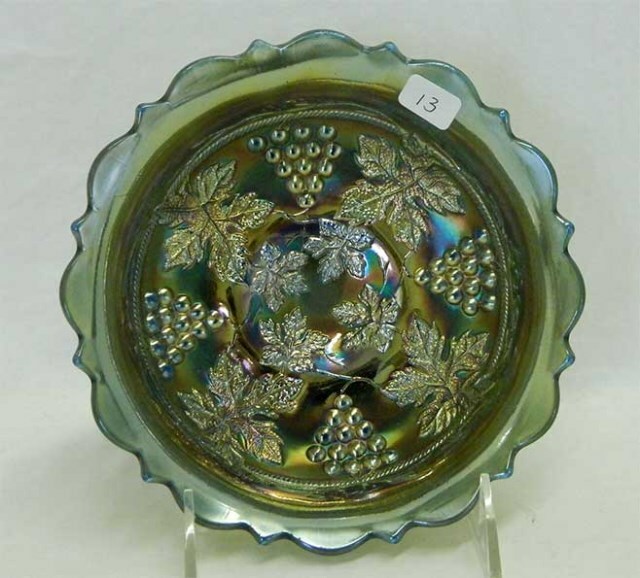 The patterns have the same components, so unless you study the arrangement of the grapes, it's often hard to tell which is which. 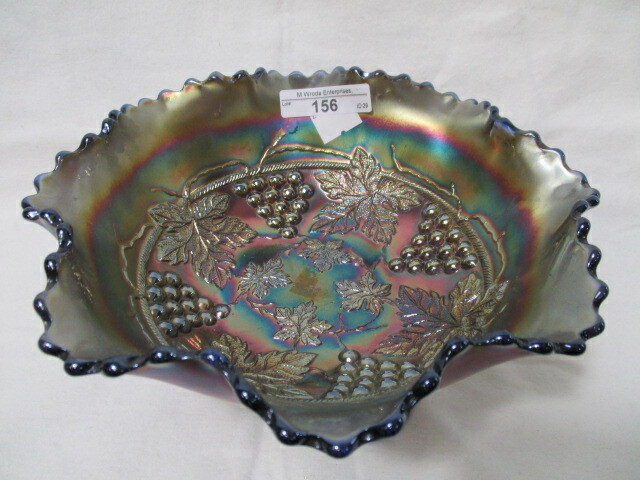 To begin with, Fenton made only bowls and plates; any other shapes will be Northwood. 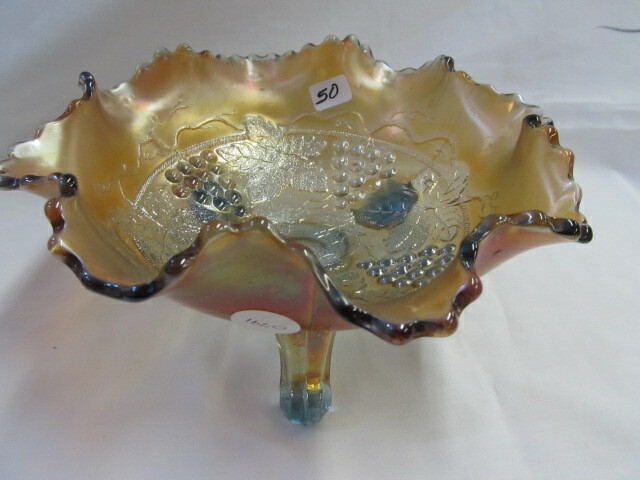 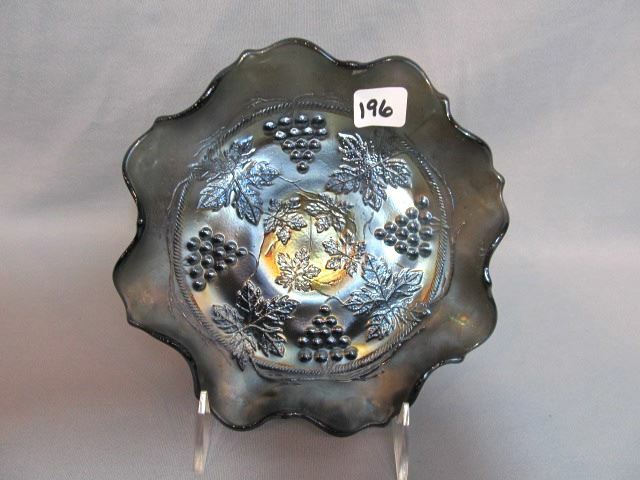 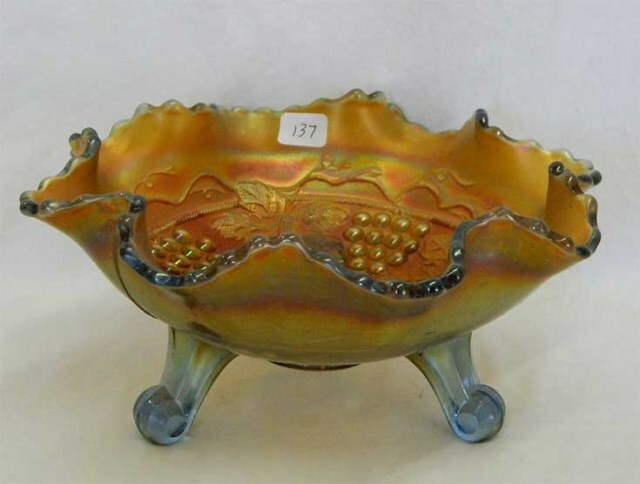 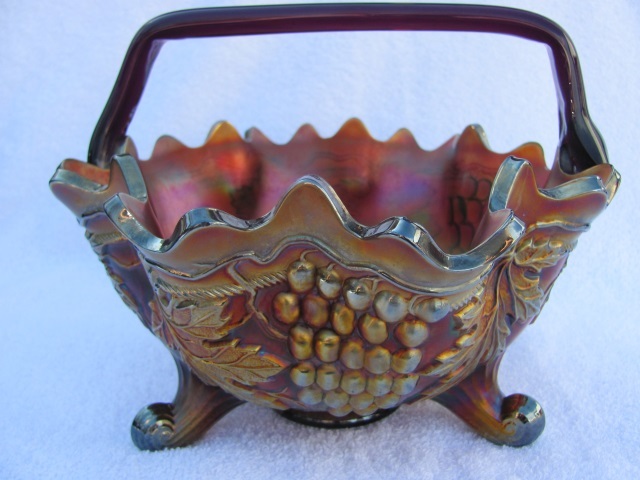 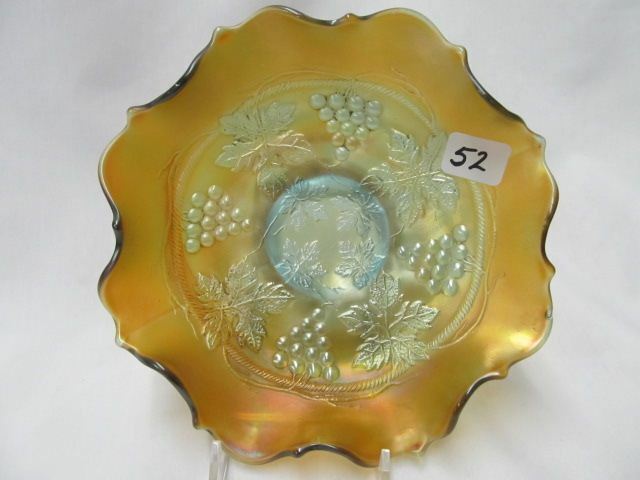 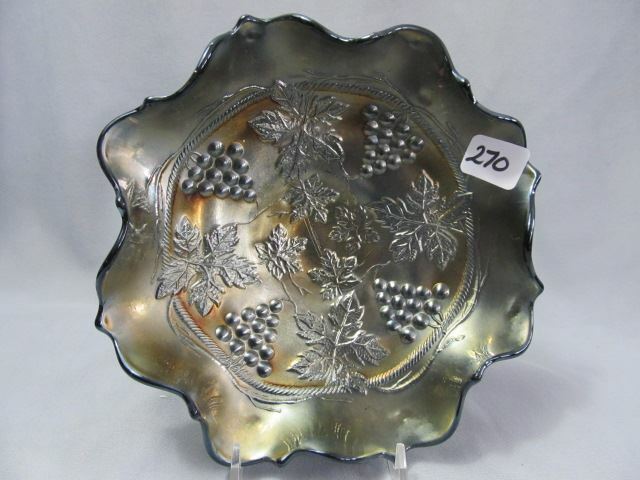 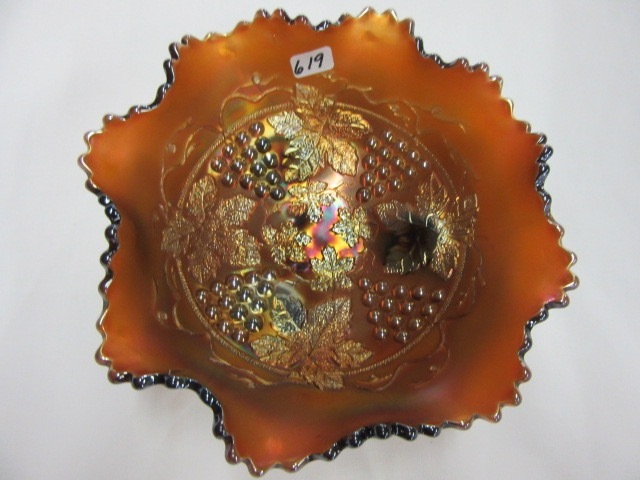 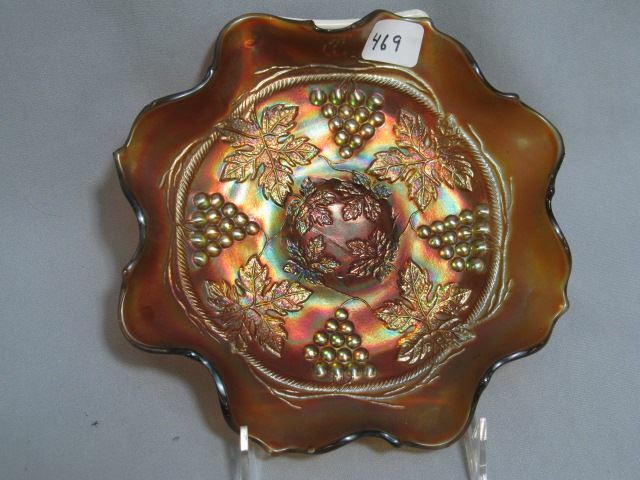 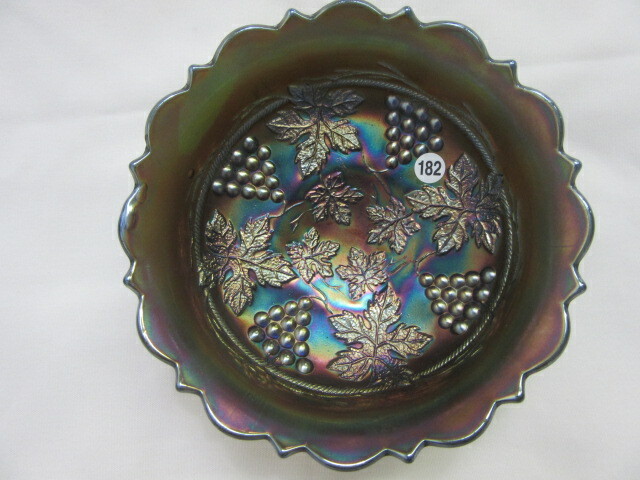 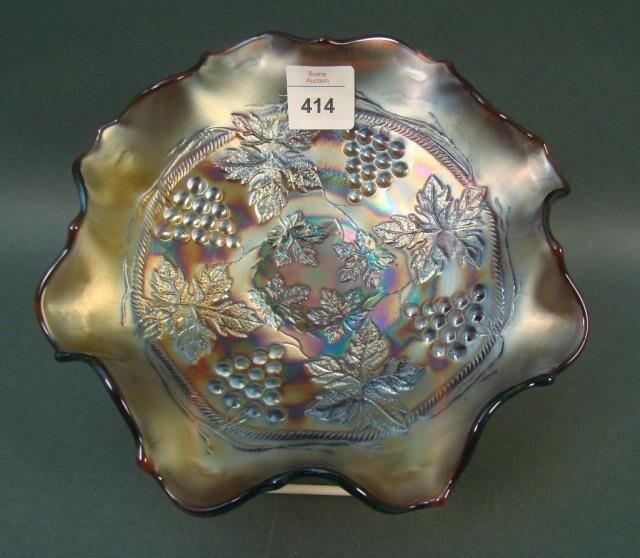 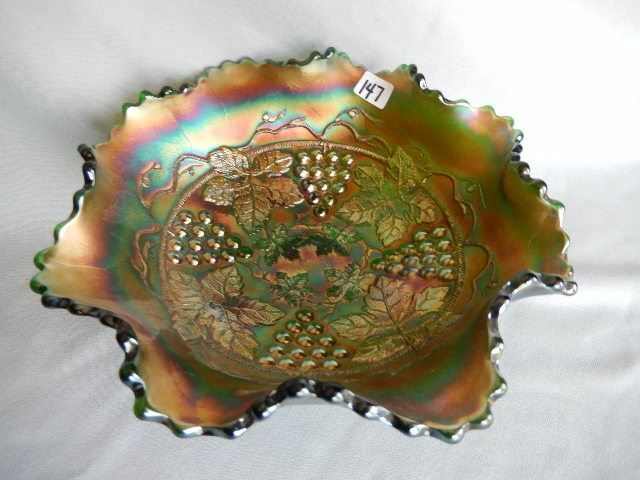 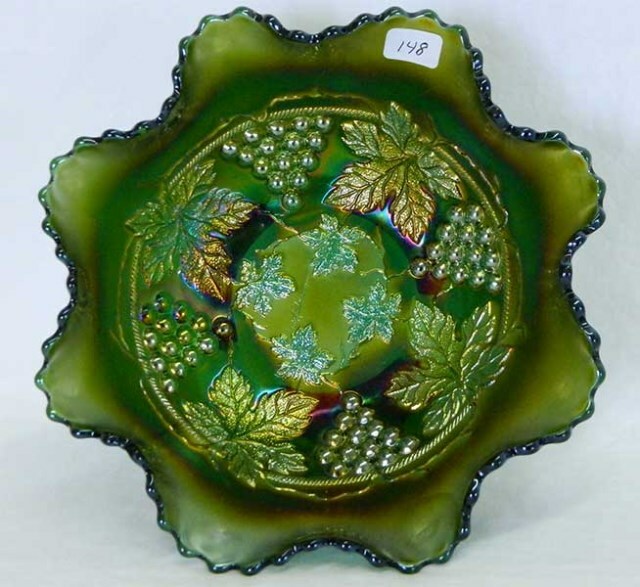 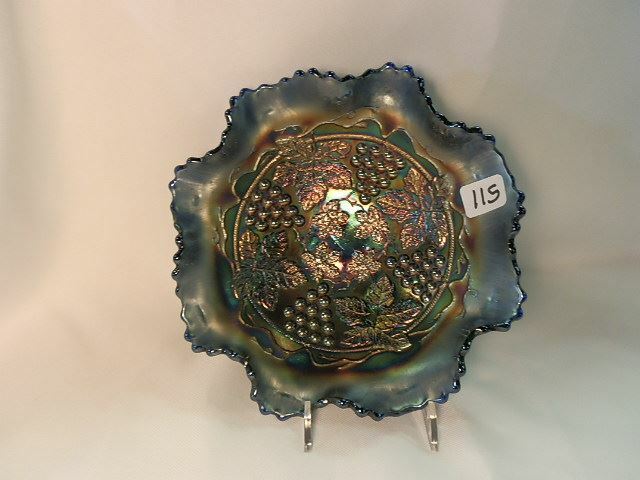 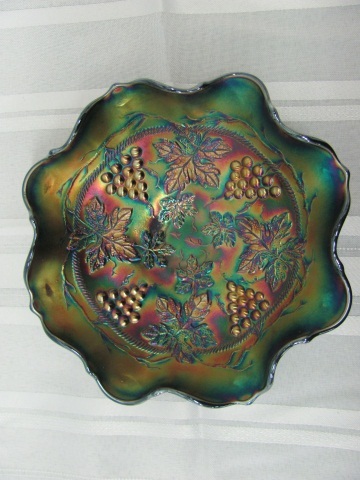 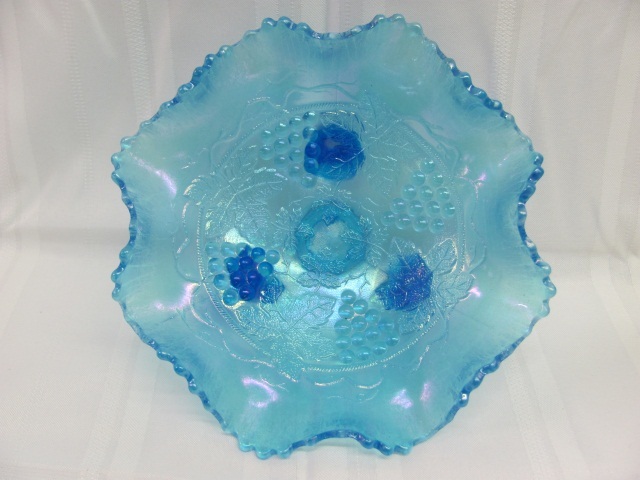 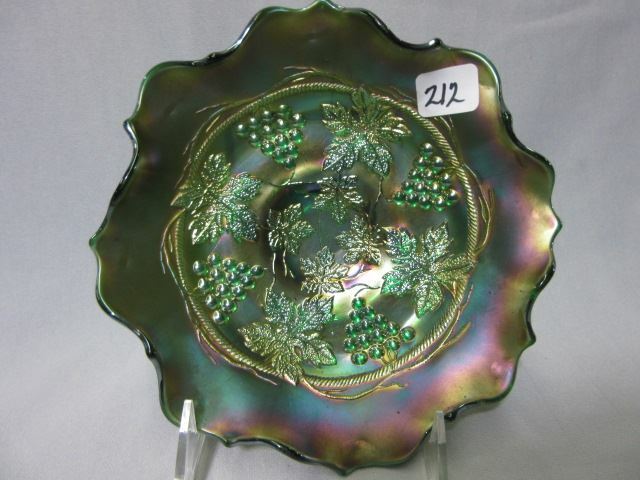 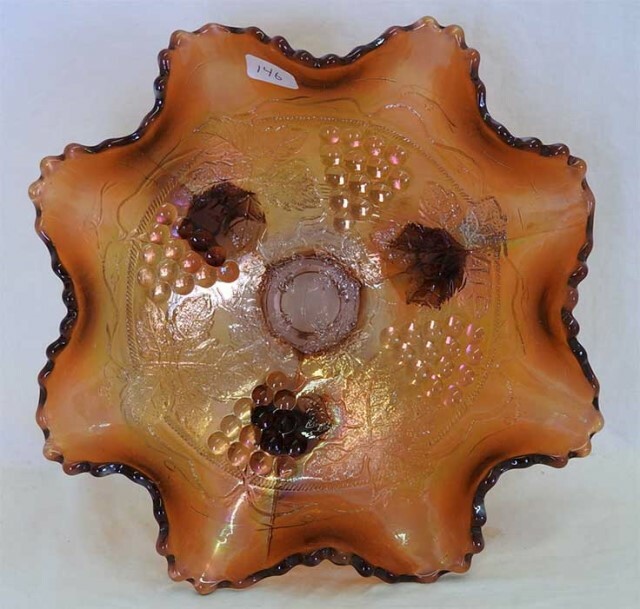 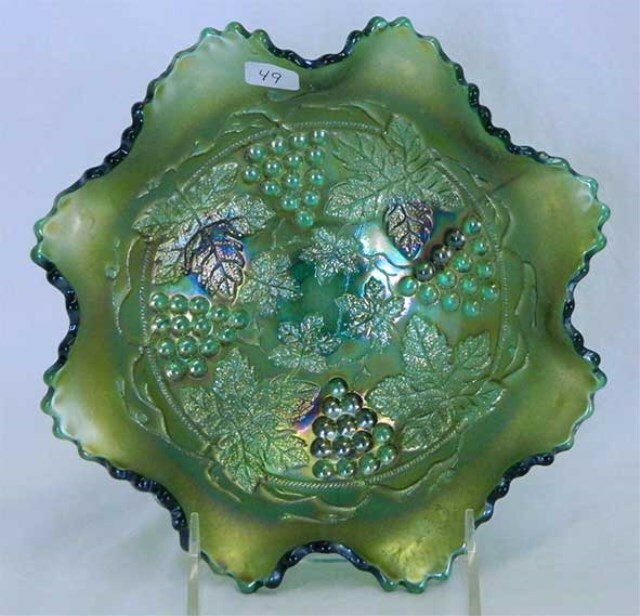 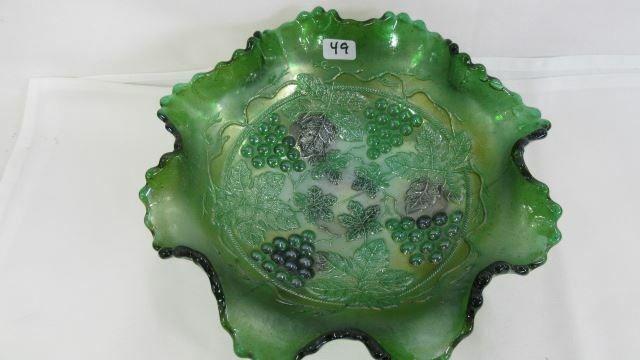 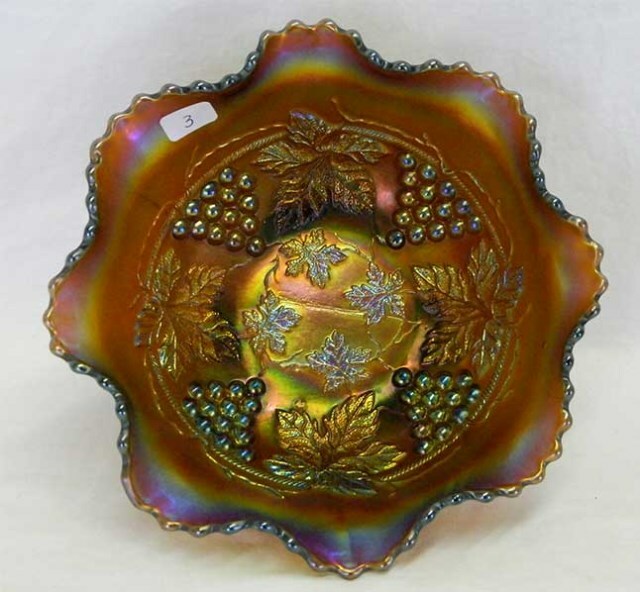 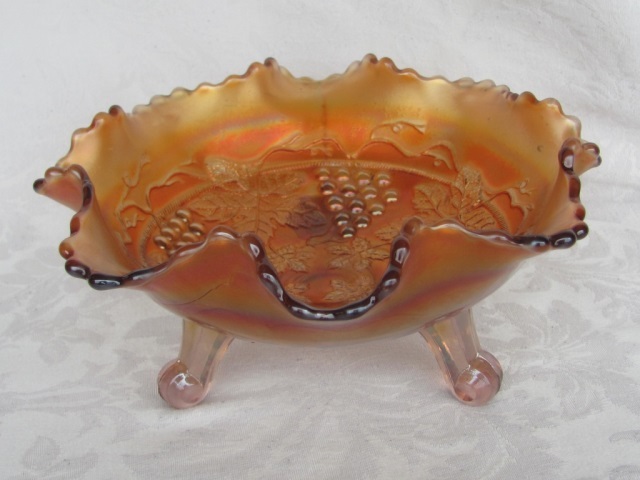 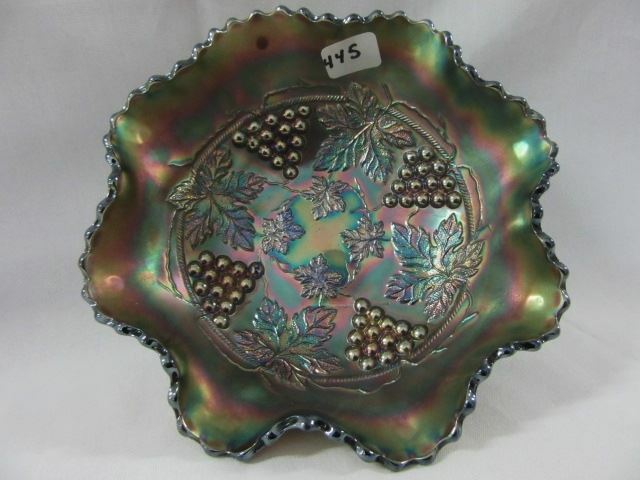 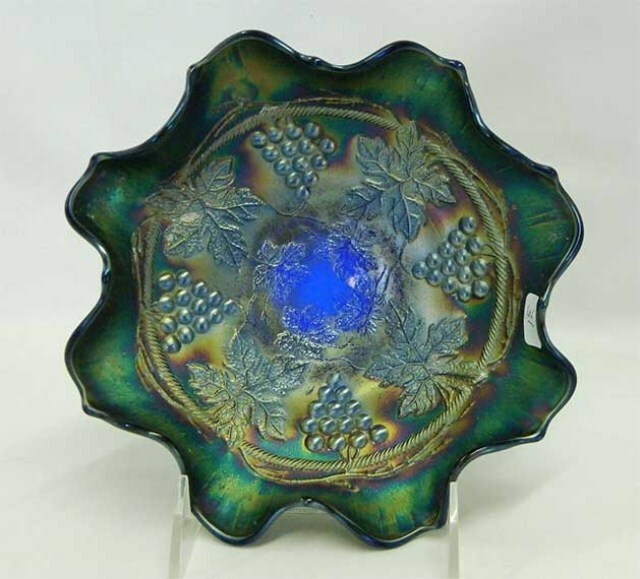 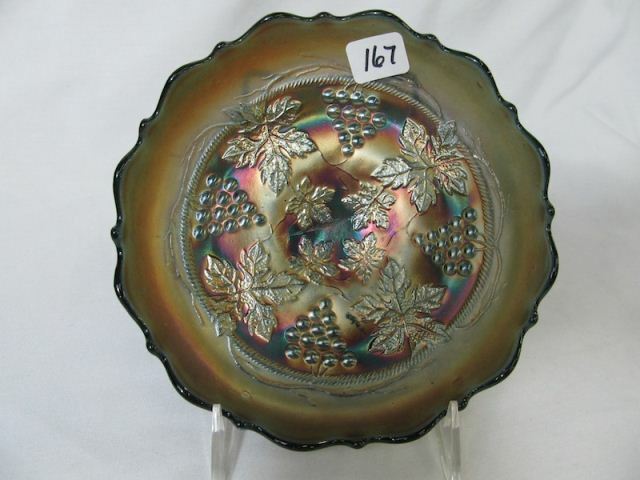 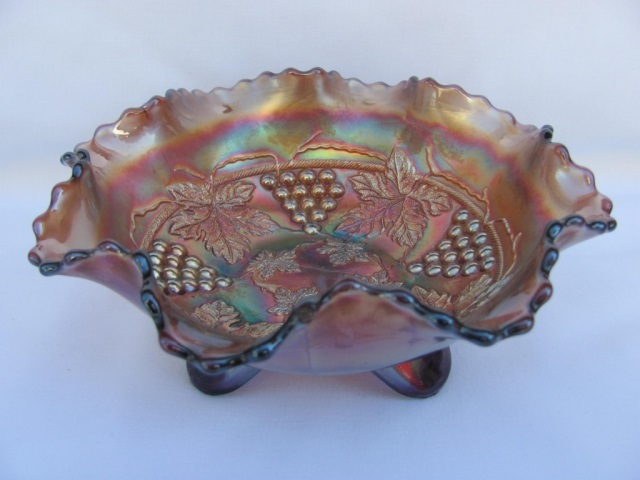 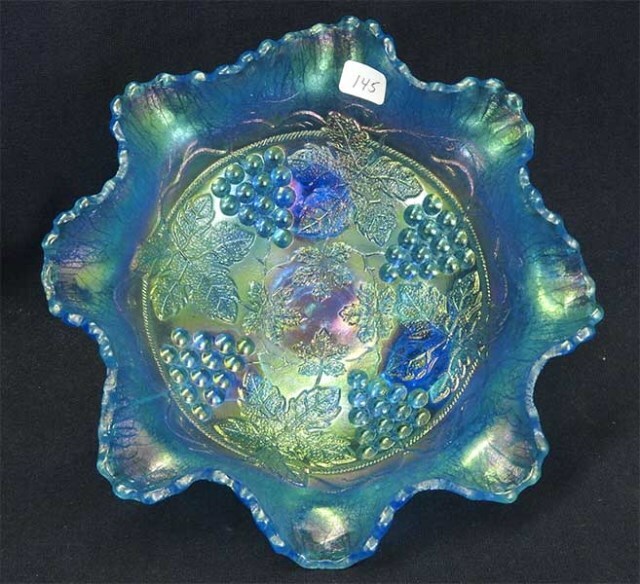 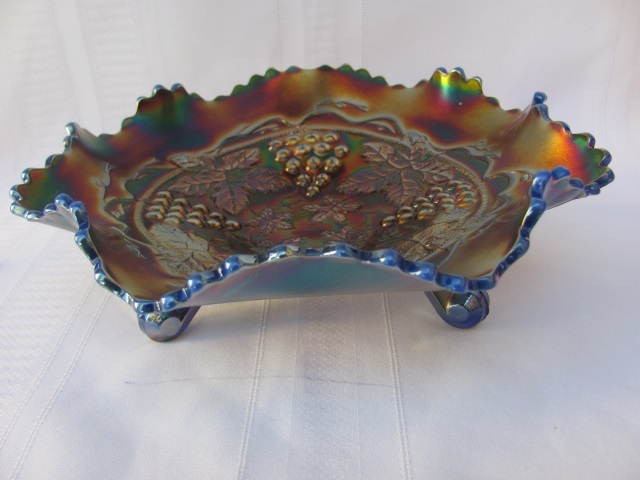 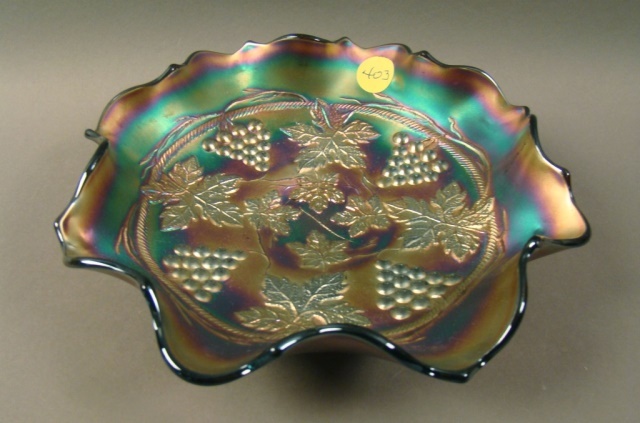 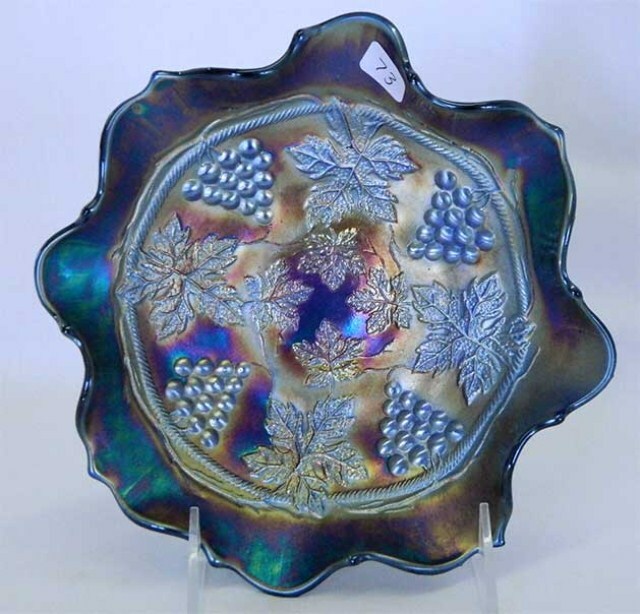 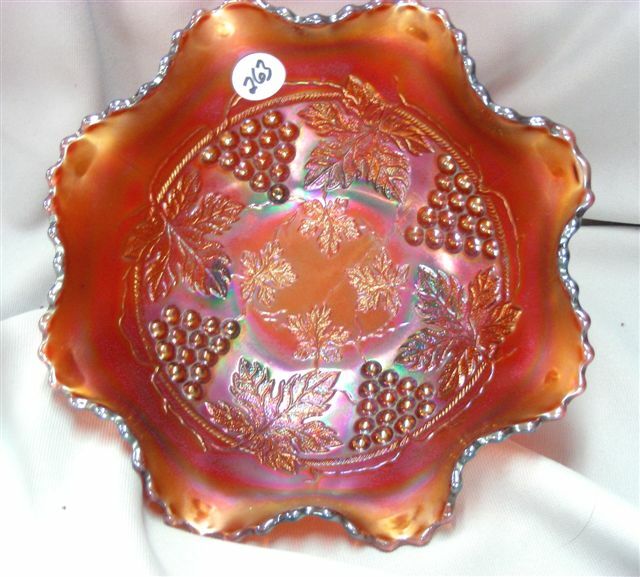 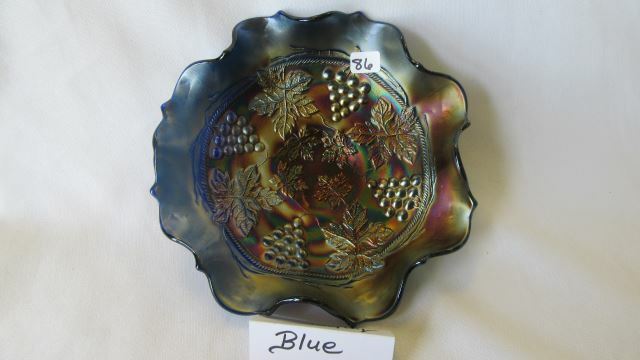 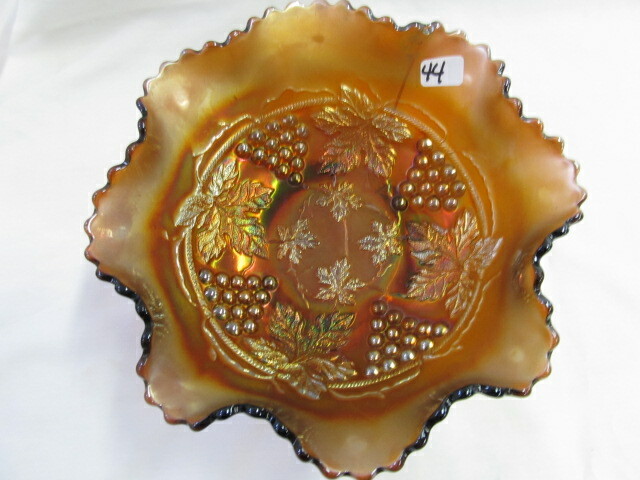 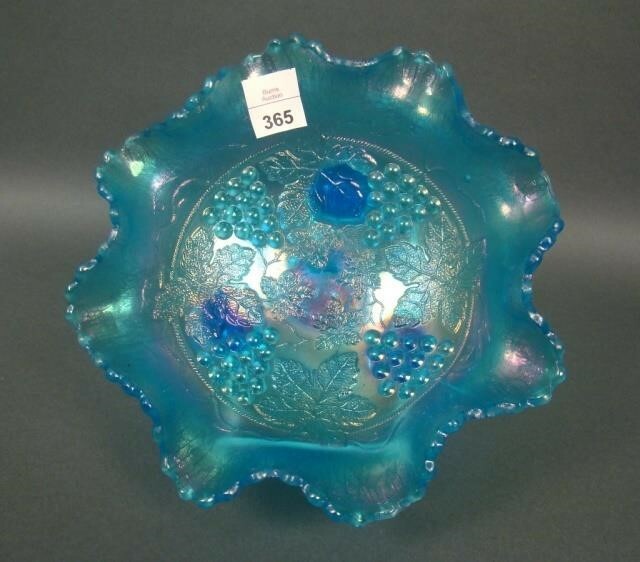 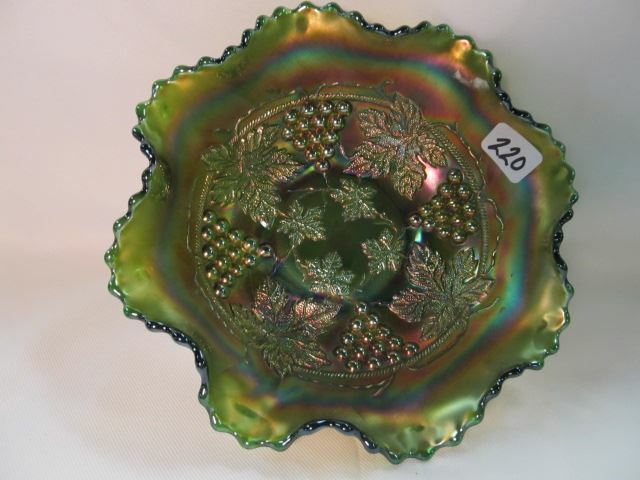 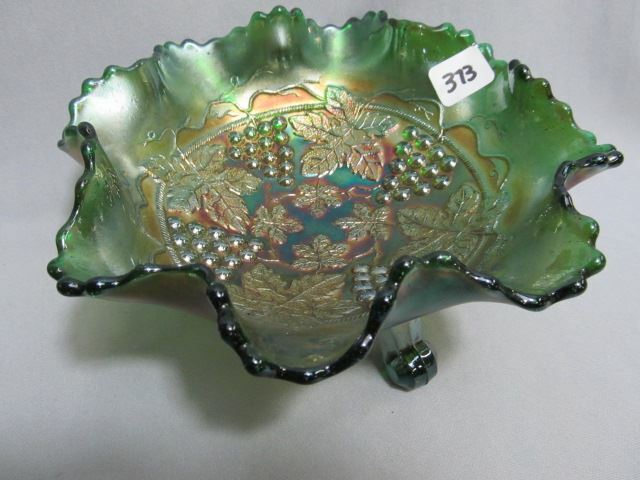 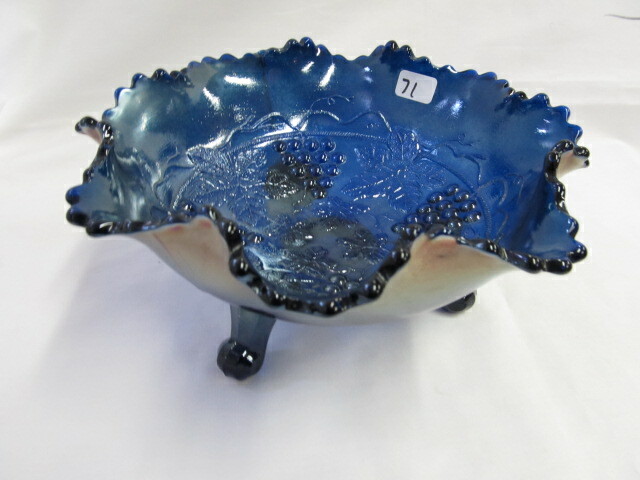 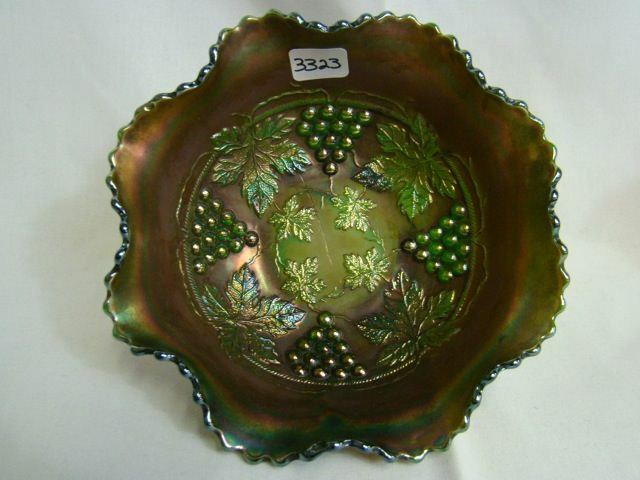 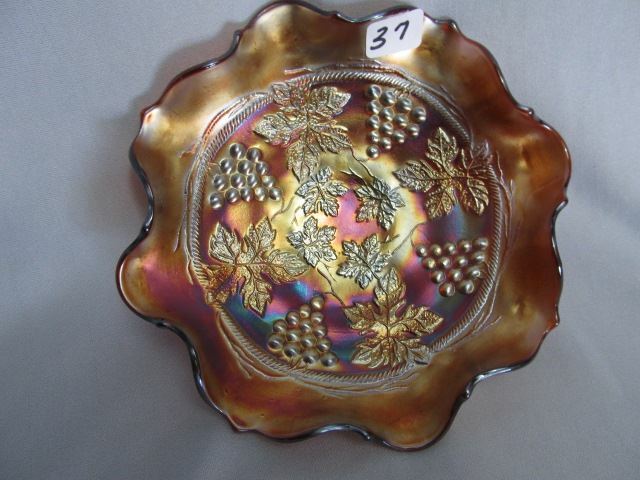 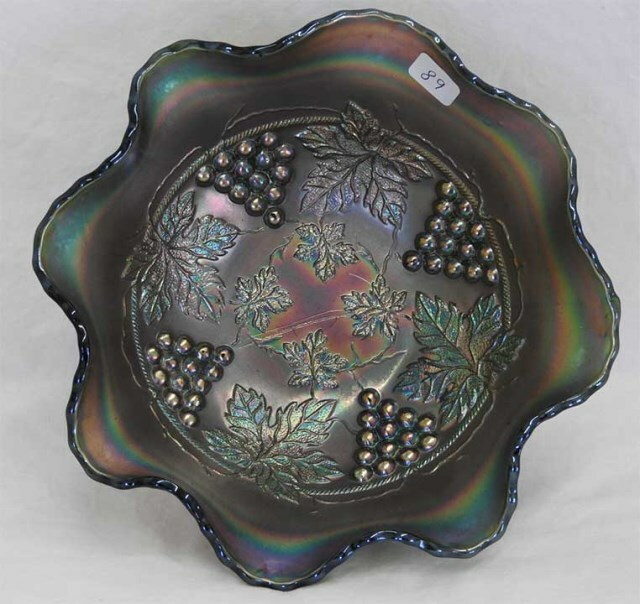 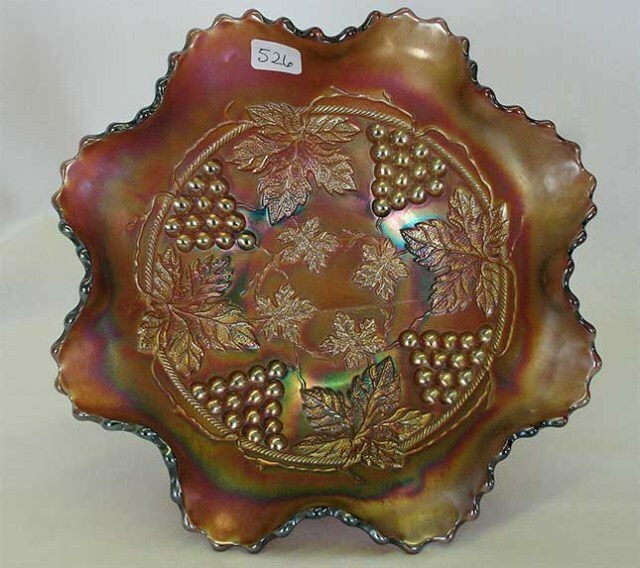 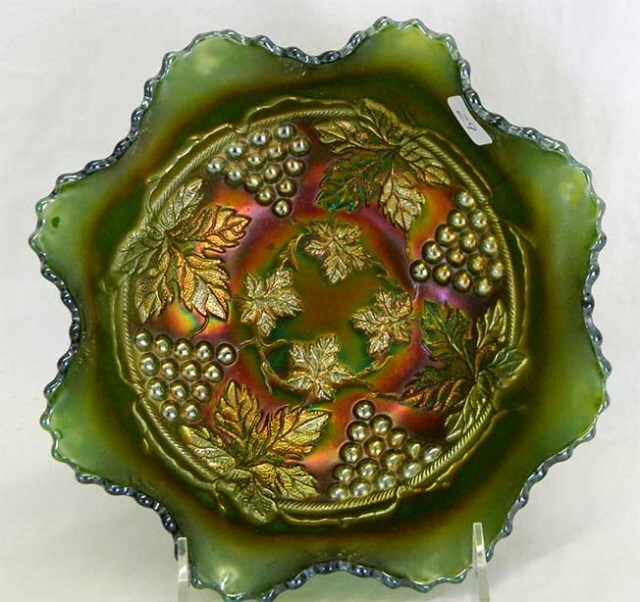 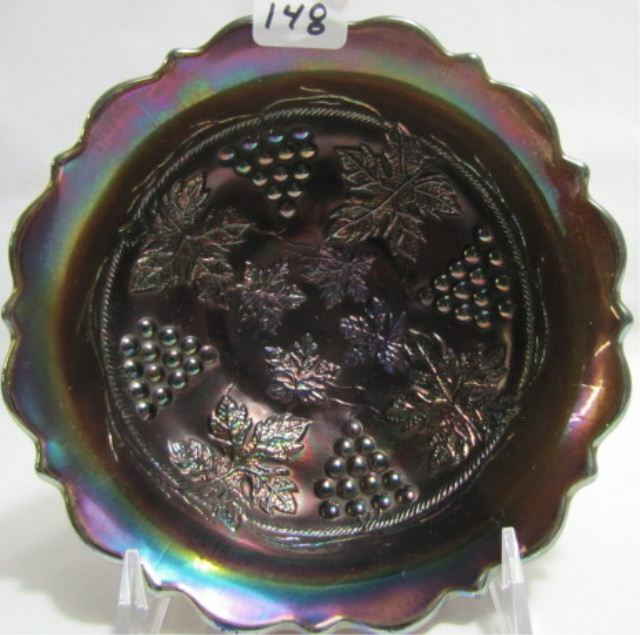 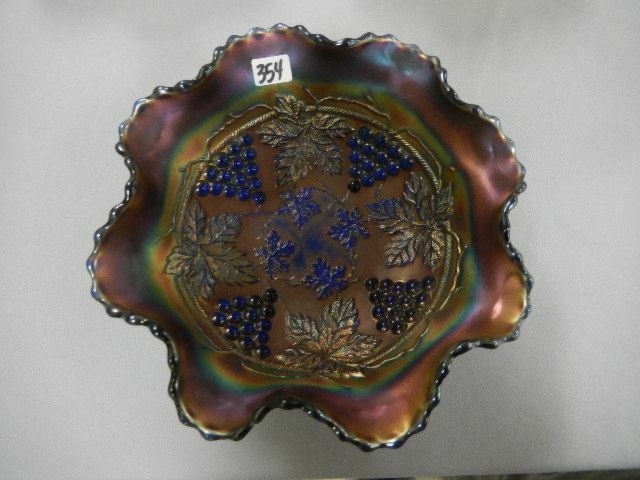 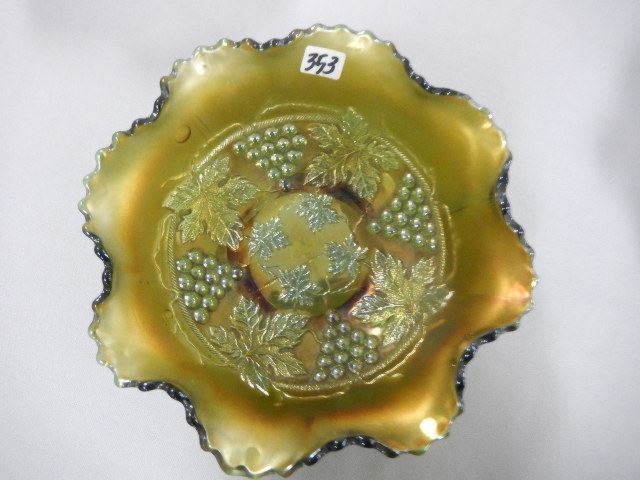 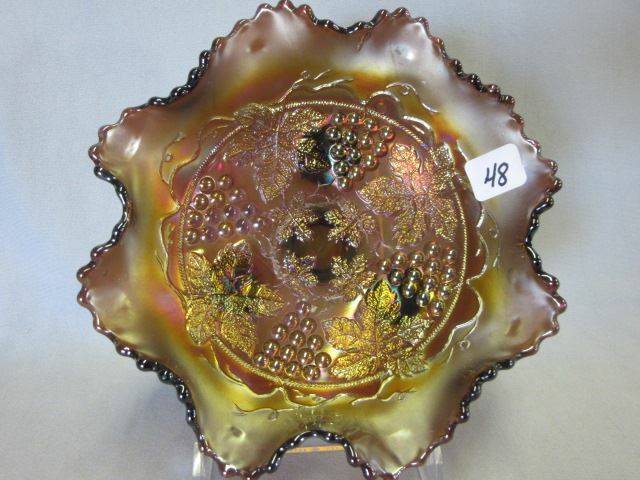 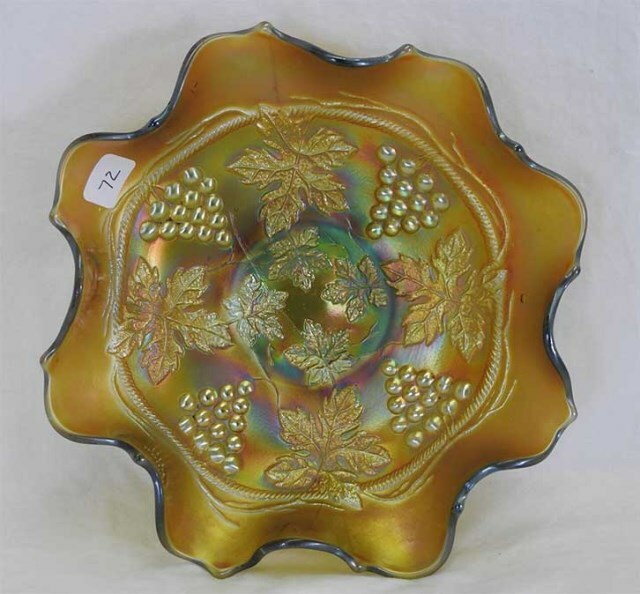 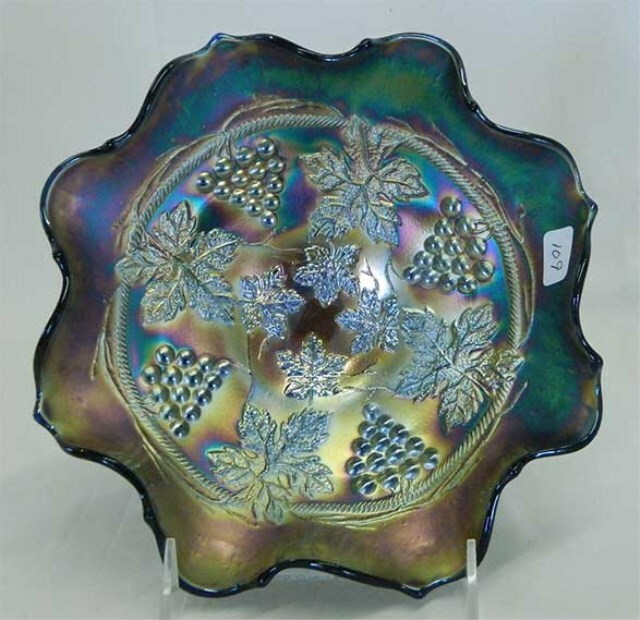 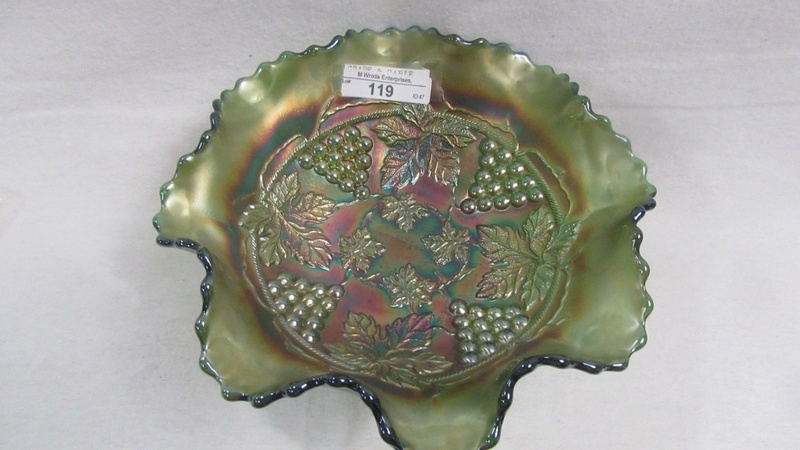 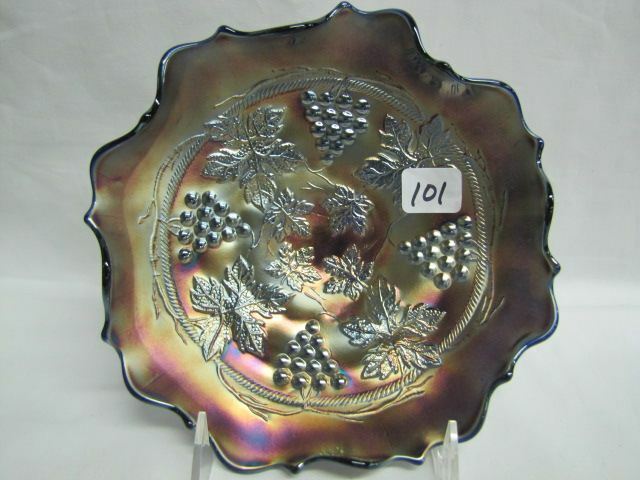 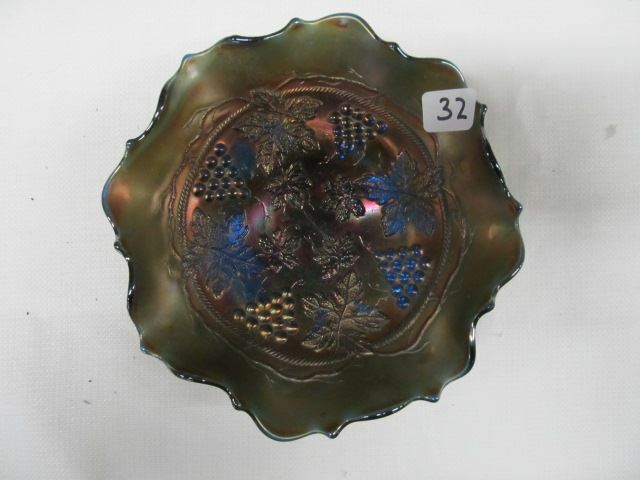 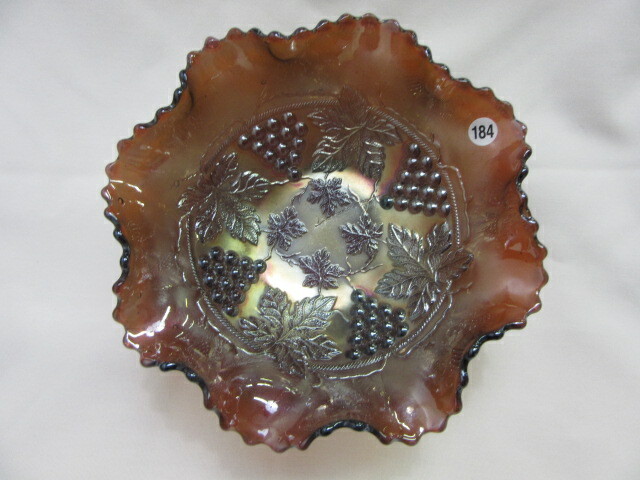 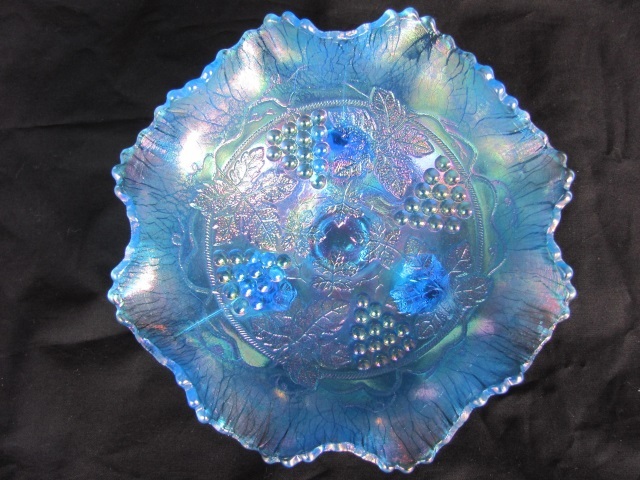 Fenton issued Grape and Cable made from three different molds plus the large fruit bowl with the Grape and Cable pattern on the outside. 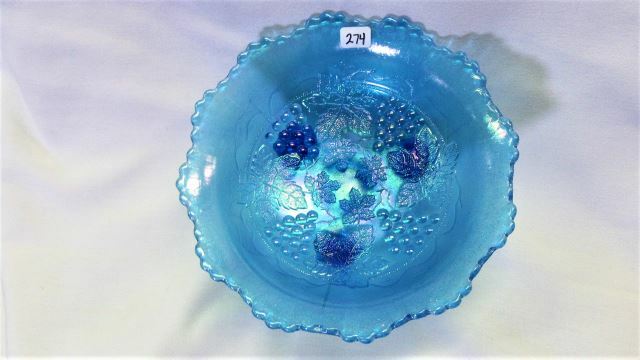 The smallest and most common Fenton bowls are like the green one in the upper left. 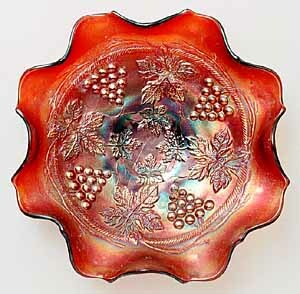 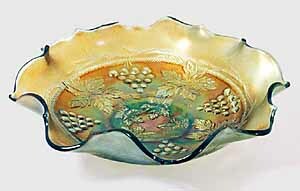 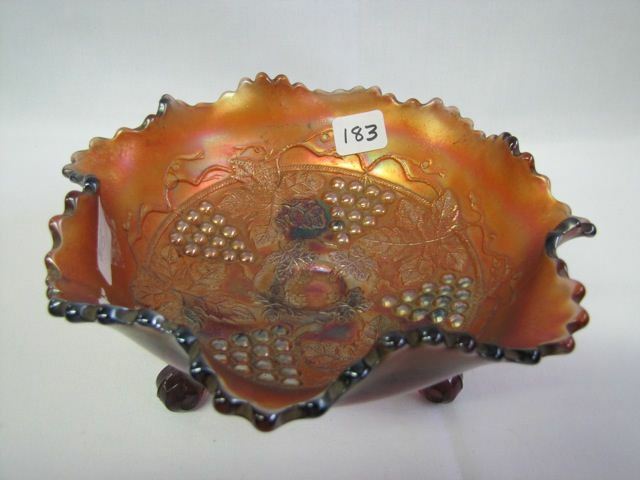 In this case, the edge is distinctive with a sort of scalloped effect–also shown in the red bowl at the right–and they have a collar base. 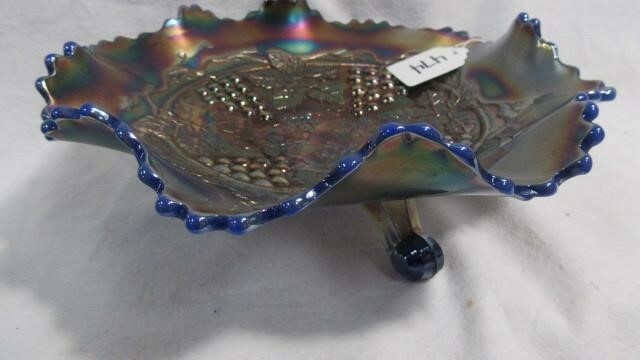 There are also spatula footed bowls. 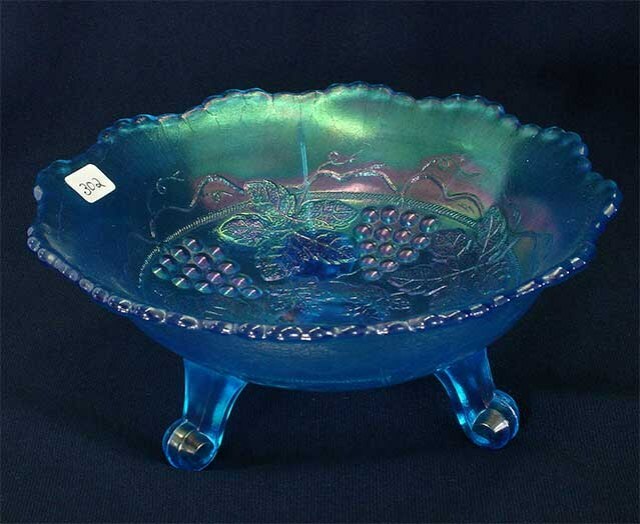 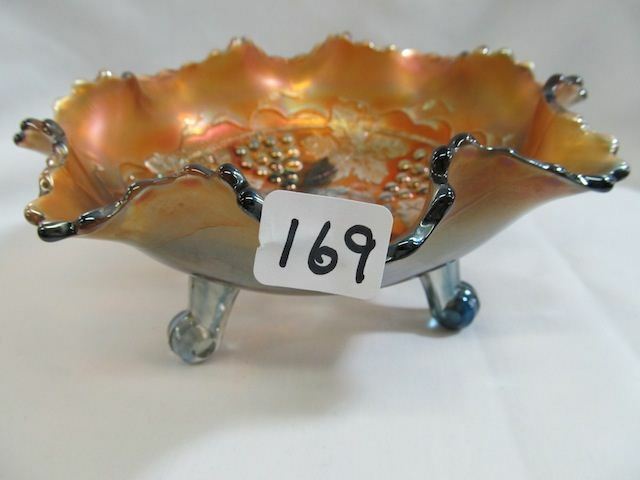 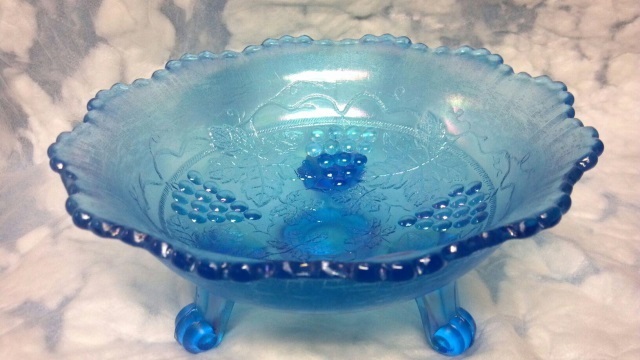 The least often seen Fenton bowl is the one with smooth ball feet like that above right. 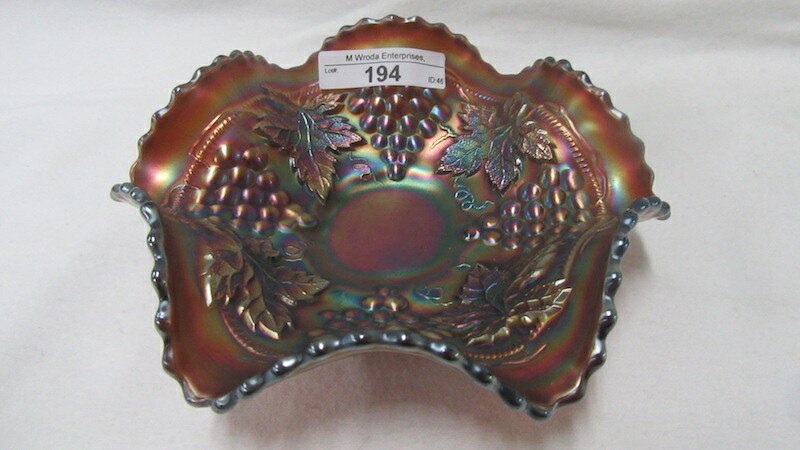 It has a sawtooth edge like Northwood's. 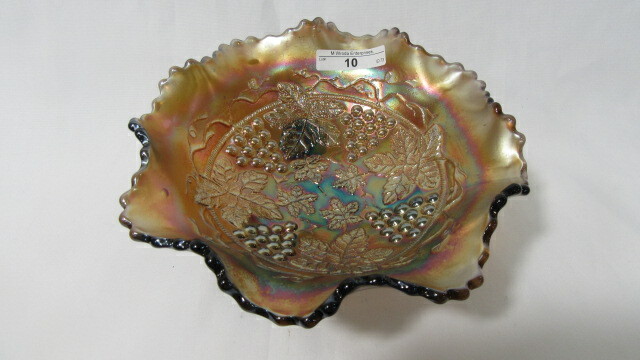 Finally, there is the large fruit bowl that usually has the Persian Medallion interior, though a few are plain inside. 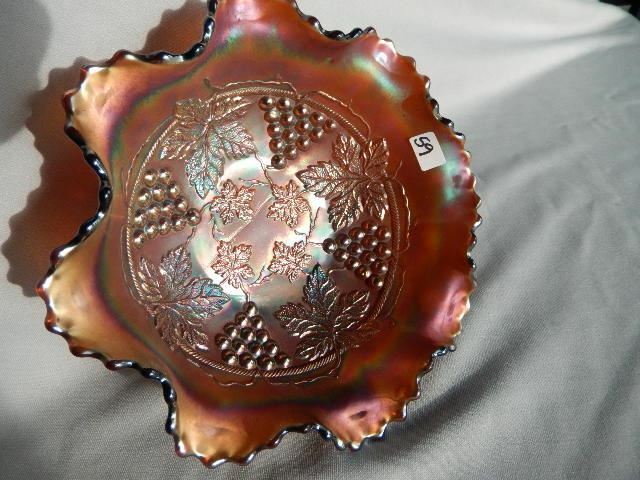 There are also small sauces that match this bowl. 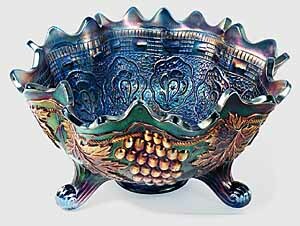 A few bowls have been made into spittoons. 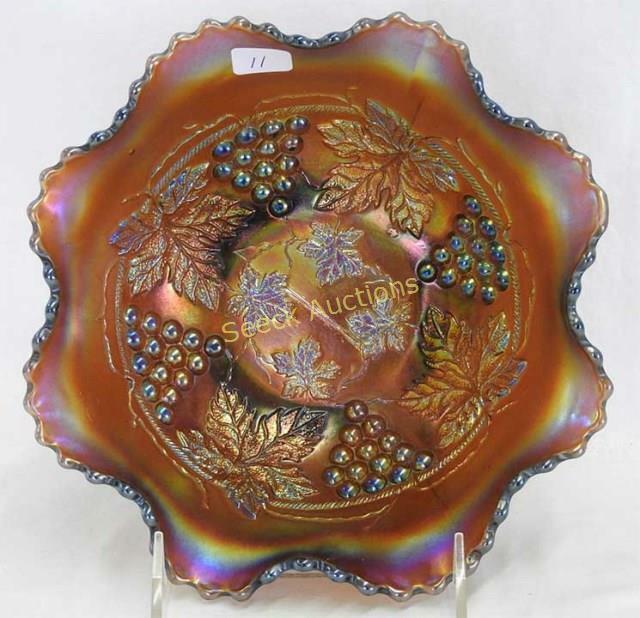 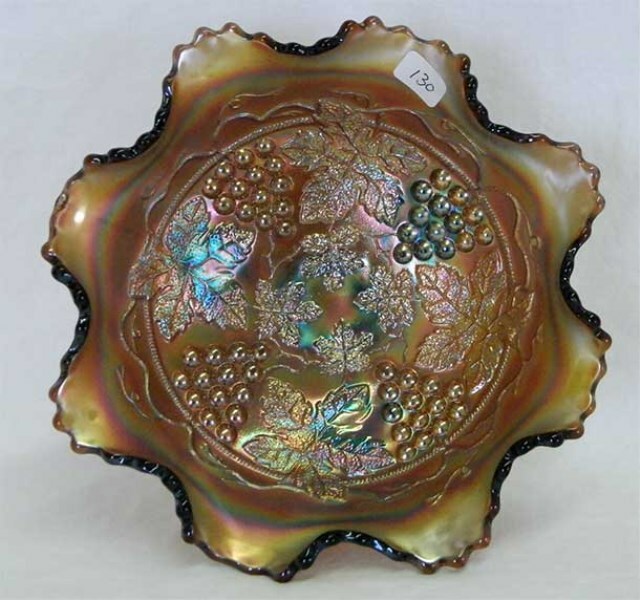 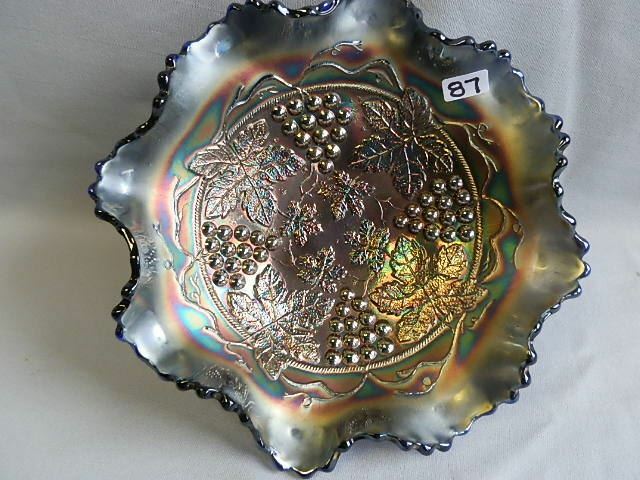 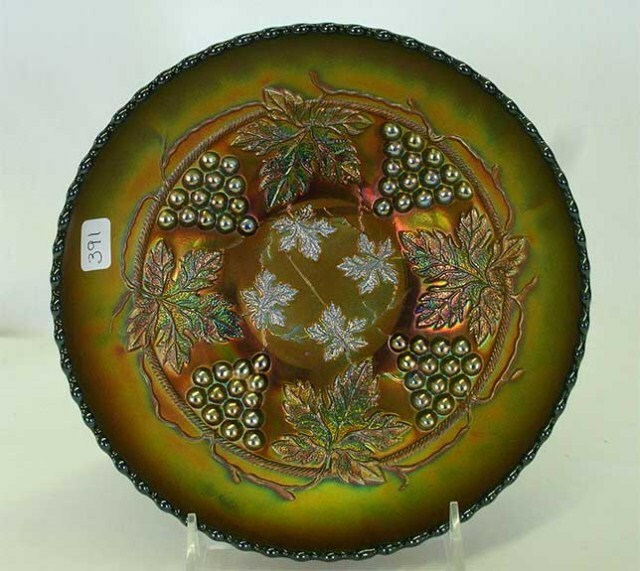 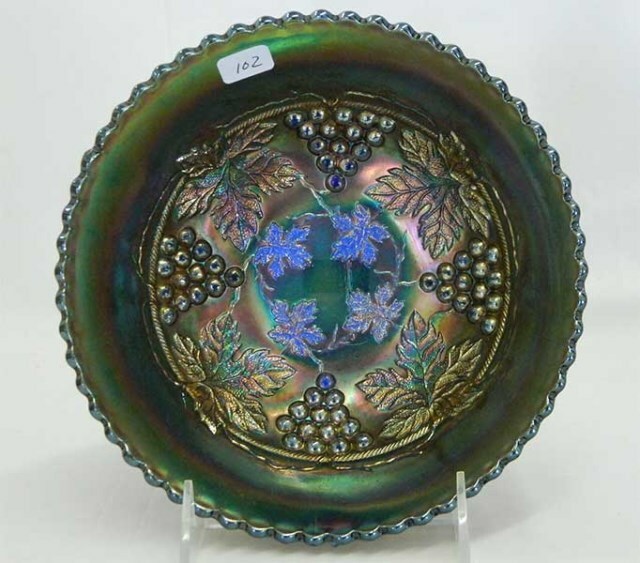 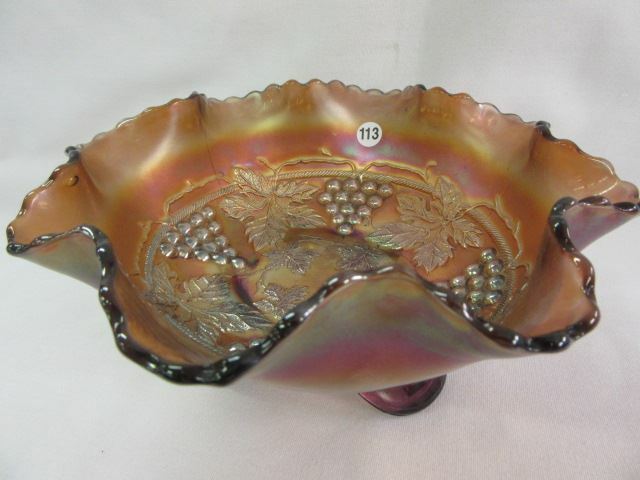 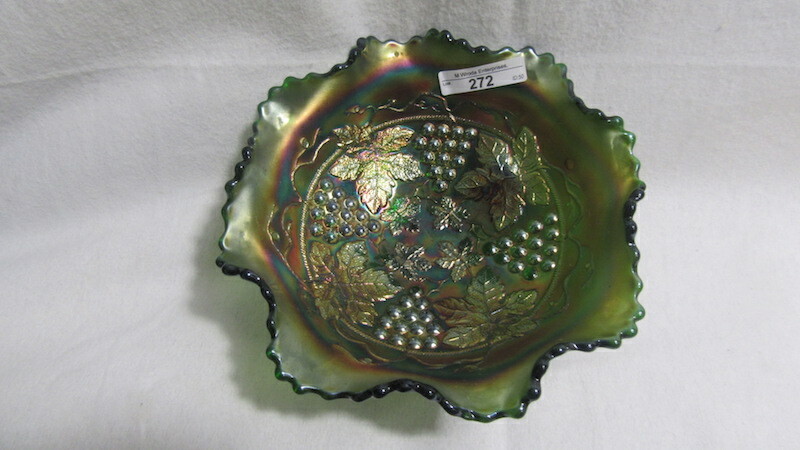 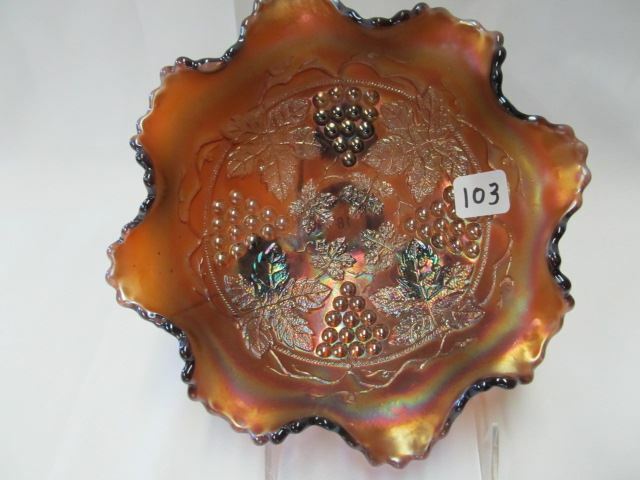 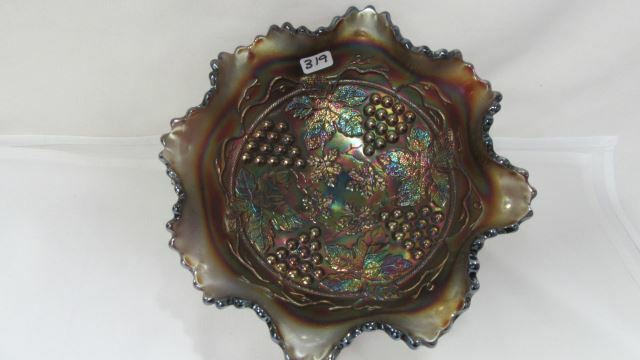 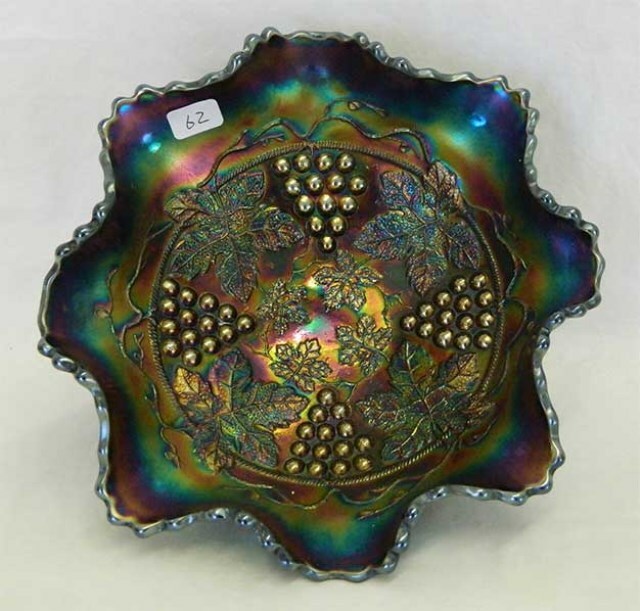 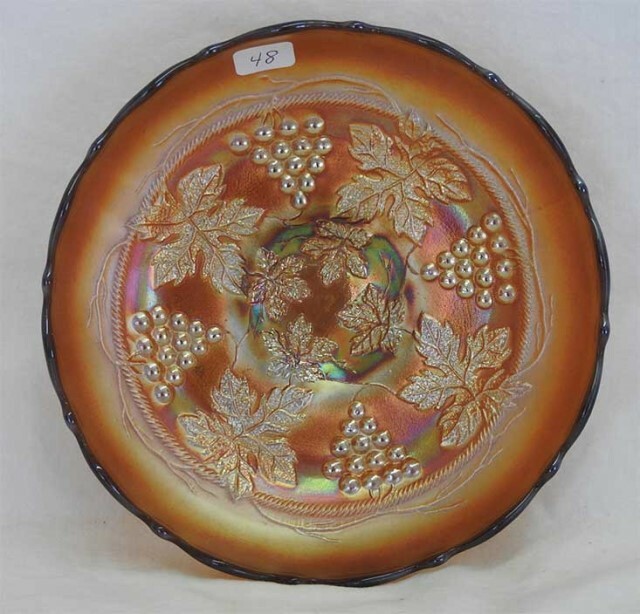 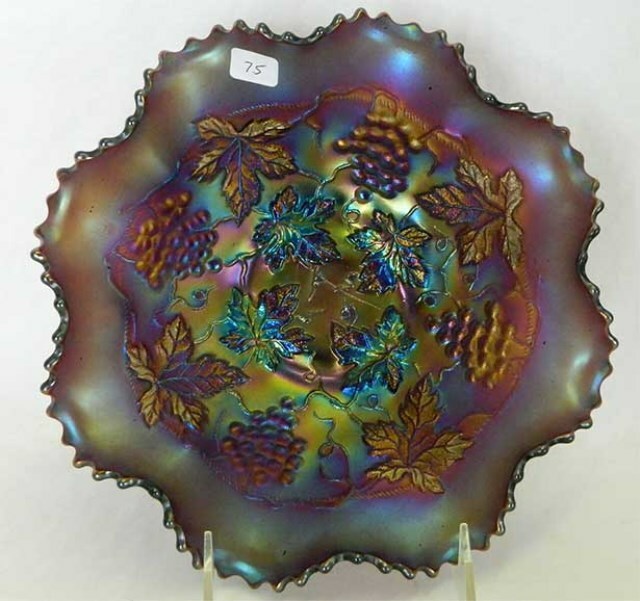 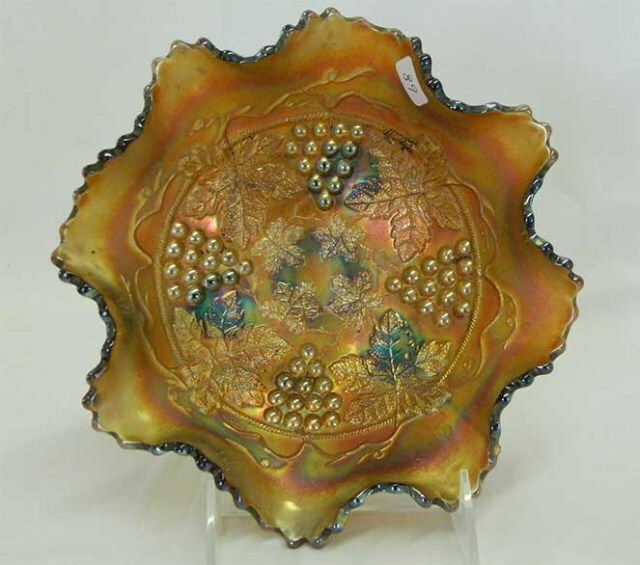 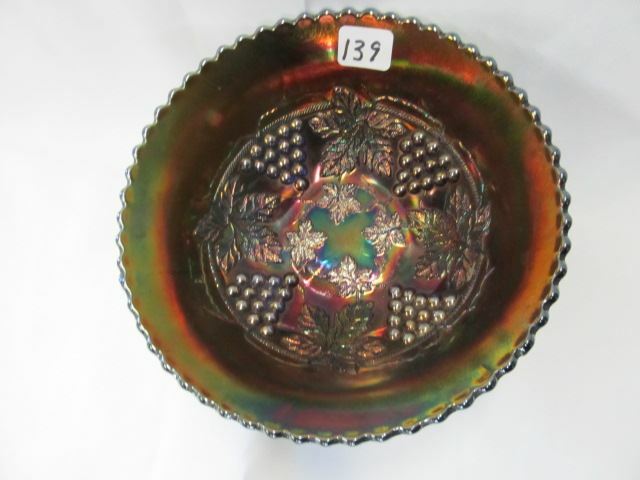 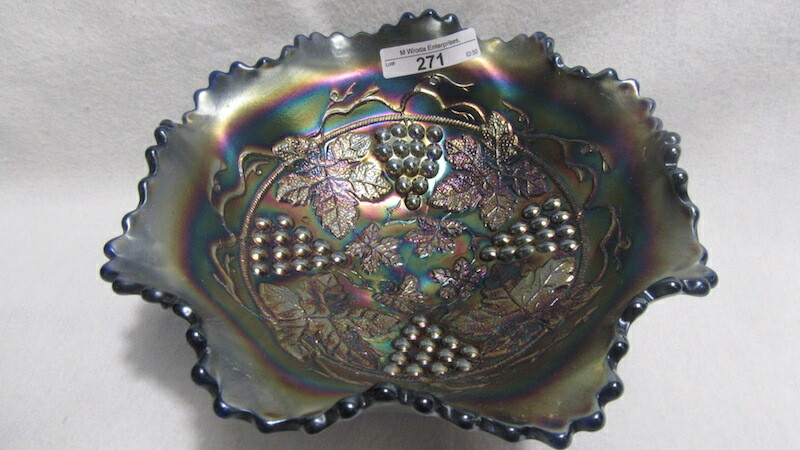 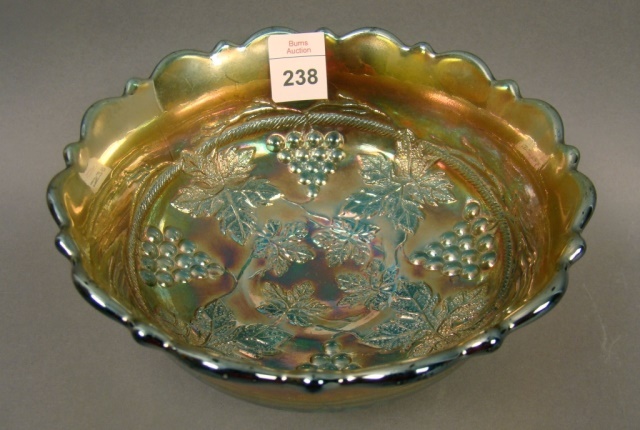 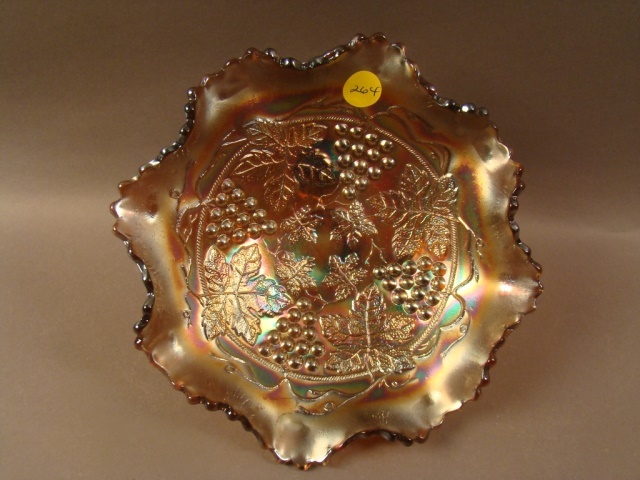 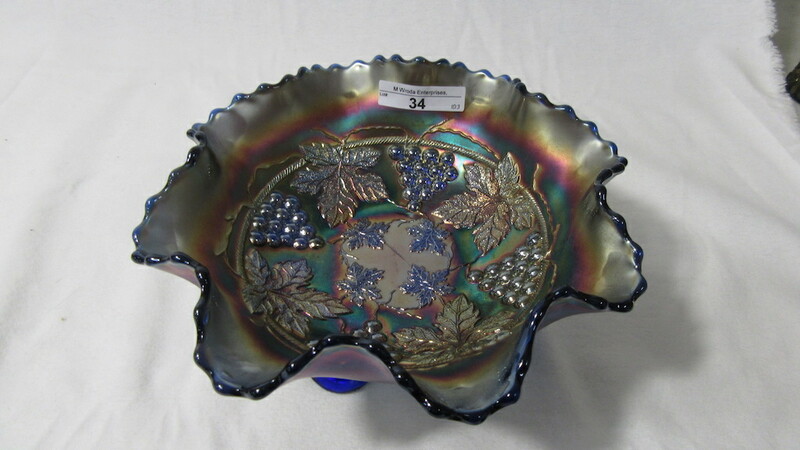 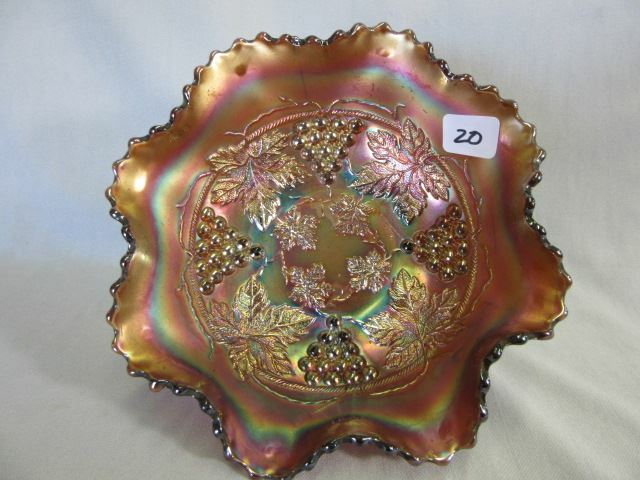 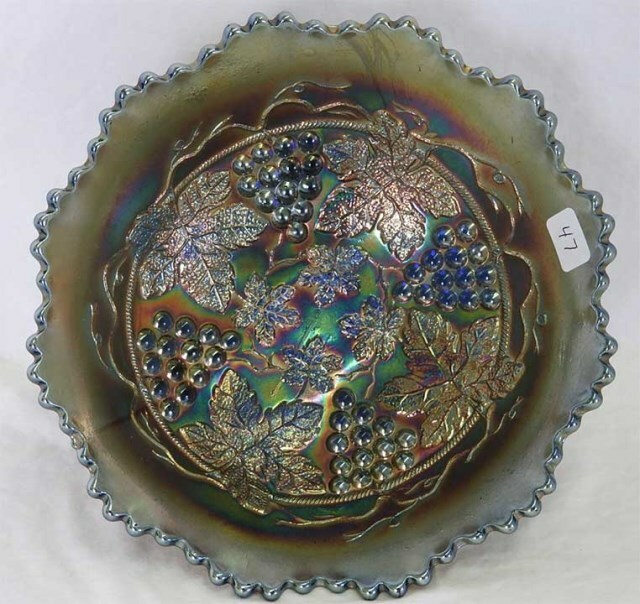 On the right, the amethyst tri-cornered bowl whimsied from a fruit bowl sold in 2008 for $550; another sold for $400 in 2011. 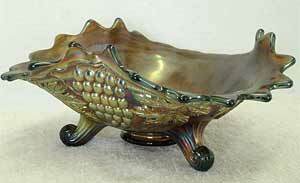 Also see Pacific Coast Mail Order bowls.